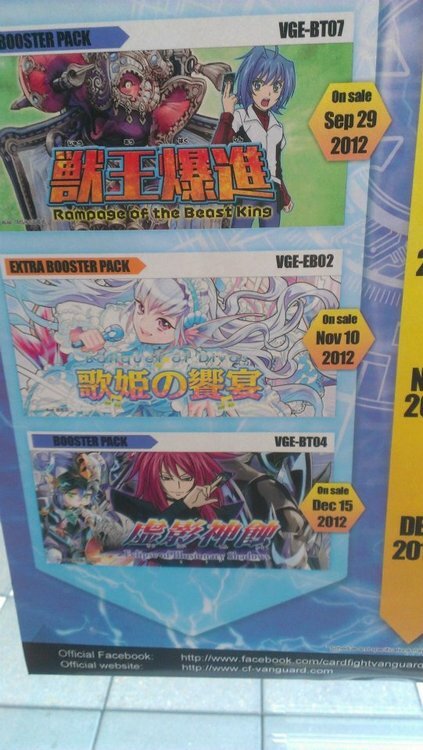 Images of Bushiroad's advertisements, showcasing the release dates for Rampage of the Beast King, Banquet of Divas and Eclipse of Illusionary Shadows have surfaced, unveiling the release dates for several of Cardfight's most anticipated English-language sets. VGE-BT07 will be released on September 29, 2012, bringing the much-lauded Great Nature clan to full prominence in the English game. As BT02 was introduced relatively recently in the EN side when compared to the gap in Japanese releases, the clan is likely to see more widespread use in this part of the ocean. VGE-EB02 will be released on November 10, 2012, filling out the Bermuda Triangle clan. Being one of the easier to assemble decks, the last question remaining regarding this set is whether or not additional promo cards will be introduced as with prior English-language sets, and if those promos will maintain the set's monoclan theme or if these will interrupt the existing pattern. VGE-BT04 will come out on December 15, 2012, finishing the Shadow Paladin clan that VGE-EB03 will globally introduce in seven days' time. With added support to the Dimension Police clan, its release is speculated to be followed closely by VGE-BT08, which will similarly bring the Police new limit breakers following Glory Maker, and thereby give them greater prominence in the North America and European game.